Something funny for a Wednesday. My wife told me this was on youtube and it's one of my favourite Python songs. I just received my single coil parts today and they look great. Probably by early next week I should have a set done. I am focused on my new winder right now and the faceplates are finished for the humbuckers. I had to make a different plate for each string spacing with the way I decided to mount them. I think instead of a reverse switch I will simply mount the coilwork on the machine the other way for RWRP coils. That way the winder will still run clockwise and the bobbins will come up to meet the wire rather than down. The next challenge is finding a way to mount the counter. Unbelievable tone! Dickey Bett's burst through a 1965 JTM45 with KT66 tubes and pre-rola celestions. I can actually taste that tone. I bought this pickup off of E-bay used and broken. So I re-wound it to my V-59 specs. Turned out very nice. Used the original A2 magnet and all the parts. It's actually pretty tough to find broken pickups. I've canvassed the local music stores but they either don't have any or they fix them themselves. I have found that Butstbucker's scatterwound to their original specs are an incredible pickup. Knock a little gauss off the magnet and it sounds very sweet. They also benefit from a magnet swap to Alnico 4 without re-winding. This is from the "Old Grey Whistle Test" in 1974. Ronnie Montrose is another original burst player from way back. And check out Sammy Hagar when he had talent. I went and got my mail yesterday and there was an envelope for my daughter. She doesn't get much mail so it caught my attention. As I looked closer at it I realized it was a credit card offer. I know, that's not really that interesting. What makes it amusing is that my daughter is 8 years old. MBNA is offering her up to $100,000 credit, based on approval. If I didn't think there would be fraud charges involved I'd have her fill it out and send it back. It's not the best shot but here is the first production VHB-3 with all the "case candy". I do like the set-up of this shot. I think it works well for E-bay. I like the look of the reverse zebra. Guitars that have a mixed bobbin look always appealed to me as well. Zebra with a double black, double cream with a zebra etc. This is the one I wound to nail down the production formula. The number of winds, tension, offset and all that. Up until I ran across this I had never heard this guy play. Amazing tone. I love the bigsby beard on that 59. I believe he has since sold it. It's been on E-bay a couple of times that I know of, although that might have been a scam. This is from a cd I picked up recently. "The Complete Blue Horizon Sessions". Great recordings with all the background chatter from the studio. I find it interesting hearing all the cues and direction from the various people there. Everybody seems to be having a lot of fun and it makes it all the more enjoyable. All the cuts seem to be live off the floor. I find the music I enjoy the most is done that way. Over the last few years ( well, ten if I have to tell the truth)I have found a liking for live recordings. There's just something about the energy and spontaneity in the performance. Of course you have to have a band that can jam, like Zeppelin or Allman Brothers, to really make it worthwhile. It doesn't work with groups that just play the song as it was recorded. 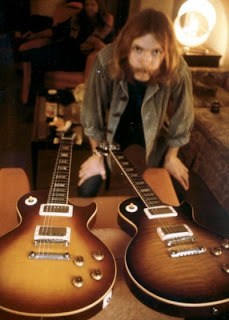 Here's a good shot of Duane Allman and his two bursts. The one on the right is "Hot 'Lanta". If I have my info correct you can hear that one on "Eat A Peach". It's a darkburst with with killer flame. The one on the left is a cherry plaintop. As you can see from my profile picture I am kind of partial to plaintops. There's nothing like a plain looking guitar with smoking tone. "The Gibson Burst" by Vic Dapra. Dapra is a really knowledgable guy by all accounts and I expect this book is very informative. It's been on the go for a number of years. I couldn't resist it so I ordered one, along with "Eat A Peach" by The Allman Brothers. "The Beauty Of The Burst" by Yasuhiko Iwanade is another must have. In addition to the pictures there are great chapters on dimensions, parts specifications etc. Pretty much any information you need to identify a burst. But I'd still call Joe Ganzler just to be absolutely sure. There are some great player pictures in there, original owner pictures and interviews with Tom Wittrock, Billy Gibbons and other enthusiasts. This is definitely the Peter Green burst here. Two of the finest in a live performance. This is my street today. This is the most snow I have seen in a number of years. But that might just be my memory.I took these before the kids got out and I shovelled. I find there is something really pleasant about being snowed in with the family. I remember heavy snows on my uncle's farm where you would literally not get off the property for 2 or 3 days. Lots of snowmobiling though. This was posted on the LP forum and I thought I would post it here for those who don't frequent the forum ( and it can't be many). It's a '59. I like the look with both styles of zebra bobbins. You can see some plastic deterioration on the pickguard and the tuners. I believe that is indicative of a specific period of production and only occurs on guitars of that time. There is something with the plastic that causes the shrinkage and dis-colouration. This was originally posted on burstserial.com and I apologize in advance if I stepped on any copyright toes. Great tune and incredible tone. 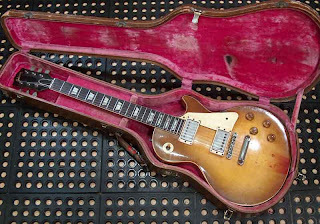 For whatever reason it looks like the top on this burst has been stripped. I strongly recommend the dvd. It's absolutely killer stuff. I thought I would take a break between winding sets and do another post to the blog. Here's a tune from a Mike Bloomfield cd that I have been listening to a lot lately, "Live At The Waldorf". I found all the cuts to be good but this one stands out. It's the only one that wasn't recorded at the Waldorf and is aguably the best cut of the bunch. Enjoy it, because tomorrow's Monday. I recently had three pickups that I made about a year ago come back to me through a customer. He purchased them off E-bay and didn't realize they were the wrong spacing for his needs. I agreed to exchange them for another set and a P-90. It's interesting to see how my technique has evolved, even over so short a period of time. It's in the fine details. I use to tape the coil after potting, now I do it before. The way I hook everything up is a little different now as opposed to then. Tape instead of heat-shrink tubing on the solder joints. It took me exactly one rewind to figure out that tubing is a hassle to remove, tape is far easier. I've incorporated ideas I've had from re-winding commercial pickups, and some of my own from out of the blue that just made sense. But there's always room for improvement. I will be putting the finishing touches on my new winder this week. I've ordered single coil parts that should be here in a couple of weeks. I look forward to expanding my product line with those and a couple of custom designs I've been kicking around. Gotta love the 80's look. It's hard to see but I believe Gary's playing the burst he got from Peter Green. Awesome tone. Edit: It was pointed out that the neck pickup isn't reversed as on the Peter Green burst, so this is one of his other bursts. 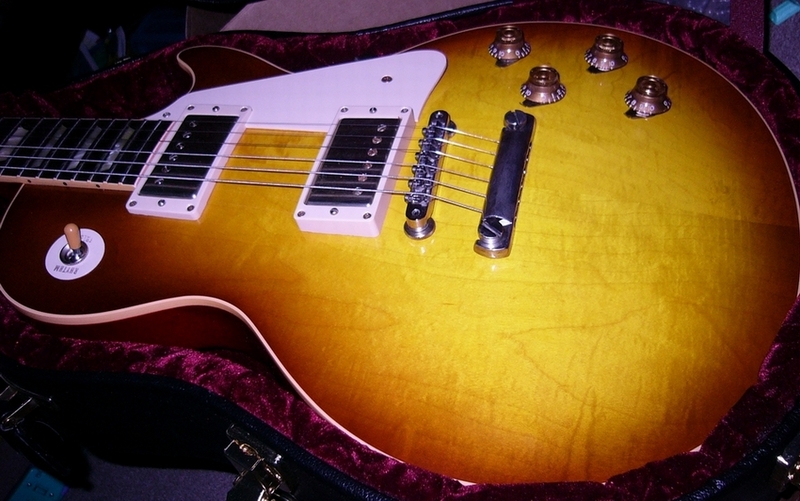 I am heavily into Les Pauls. Love 'em. I was cruising around my computer yesterday and found a few pictures. This is the one on the top left of my blog ( I know it's obvious, but I thought I would say it anyway). That's Jimmy's #1 on the left. I love the mis-matched look of the top with one side darker than the other. 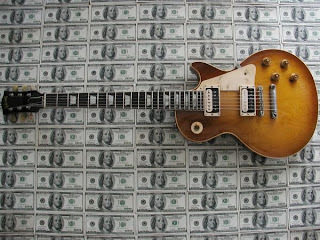 To me a Les Paul is a guitar done right. Big thick mahogany body, maple cap and mahogany neck. There is not another style or combination that comes close. If I remember correctly this guitar was literally found under a bed in Germany. Absolutely dead mint with all the case candy. The bleed onto the neck binding hasn't even faded yet. 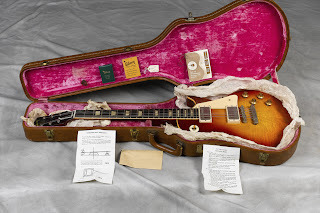 It's a 1960 with a nice flame top. Now I gotta go play. I've been working through this dvd for about three weeks now and I'm really seeing improvement. I haven't played regularly for a few years and I wanted something to knock the rust off my hands and get me back to playing regularly. There's not much here to make you a better musician, it's all about speed and accuracy to make you a better player. I've never thought that my technique was that good, so I am hoping to change that. I have even started working with a metronome, at least for the exercises. I had never heard of Tomo Fujita before but this guy smokes on guitar. He's been around for a while but not really up front. At least not in the stuff I listen to. I've also found those Guitar World dvd's pretty informative as well, although I know the mag is not held in such high regard. I have started working on my new winder. It will be made out of a hobby lathe. Nice, heavy duty and it will run way faster than I need it to. I've worked out how to make the bobbin attachments. This new one will allow me to make Fender style single coils and also my humbucker sized P-90 design. I'll post some pictures when it's done. But enough of that. It is damn cold where I am. Something like -14C for tonight and the house is so dry I could burst into flames. So why not have a tune for a cold Tuesday. You can hardly hear Slash but for my money he blows Zakk away for tone and taste. One of my favourite LP players. Another nice set of V-59's in my favourite colour. This is the wind I have in my guitar right now, except I opted for Alnico 2 in both. The bridge on this set has an Alnico 4. These guys are just insane. Too bad I missed them by about 4 years. 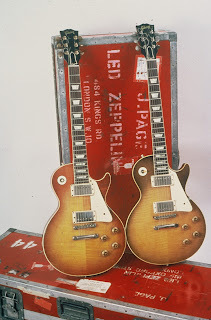 Original Gibson Les Pauls as well.